Guaido's press team confirmed their detentions by security forces in what's been described as a pre-dawn raid on their Caracas residences on Thursday. And in confirmation Guaido tweeted an "Alert" — saying the two men are "currently being held hostage" since 2:24 am by the SEBIN, or the Bolivarian National Intelligence Service. 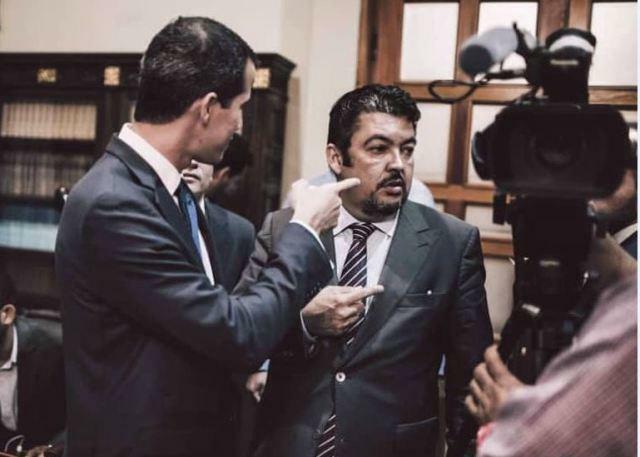 Venezuelan intelligence agents early Thursday entered the homes of opposition lawmaker Sergio Vergara and of Roberto Marrero, a lawyer who heads Guaido's office. Both men accompanied Guaido on a recent Latin American tour to build international support for his efforts to remove Maduro. A video also emerged online purporting to show Maduro security force vehicles speeding off from one of the Caracas homes in the dead of night. President Nicolas Maduro and his officials have repeatedly threatened to arrest both Guaido and his staff following his return last month from neighboring US ally Colombia where he met with US Vice President Mike Pence. "He can leave and come back and will have to see the face of justice because justice had prohibited him from him leaving the country… He has to respect the laws," Maduro told ABC News in an interview last month. Guaido had violated a Maduro imposed "ban" on his ever leaving the country. Meanwhile Trump administration officials have threatened severe repercussions if Guaido is ever touched or harmed by pro-Maduro forces. Thus far the threat has appeared to work, however, this could be the start of security forces going after Guaido's top aides one by one, which will no doubt result in significant threats of action from Washington.